Above and below: Views of the palace from the gardens. 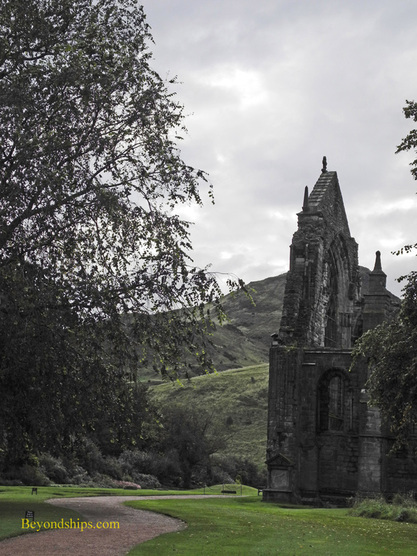 Above: Arthur's Seat from the Holyrood gardens. * The above links are solely for the reader's convenience. Beyondships has no affiliation with the entities that operate these websites and is in no way responsible for those sites or the accuracy of any information contained therein. Holyroodhouse remains the official residence of the monarch in Scotland. However, the royal family only lives there a small part of the year. The Queen is in residence during Holyrood week, which is in late June and/or early July. Prince Charles is in residence for a week each year while he carries out his duties as Earl of Rothesay. Of course, the royals also come there for special occasions such as when a foreign head of state is making a state visit. Each year, Holyrood week begins with the Ceremony of the Keys in which the Queen is given the key to the city and promptly ives it back for safekeeping. The Queen holds investitures and audiences. Honors are awarded, dignitaries met and dinners held including one for the members of the Order of the Thistle, Scotland's highest order of knights. 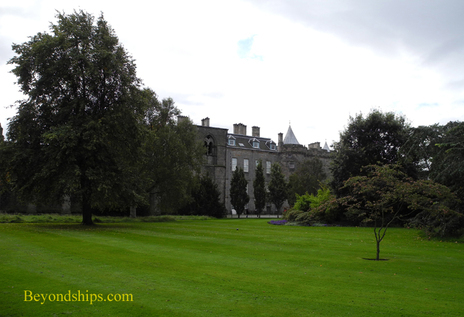 Holyroodhouse also acts as a base for attending other ceremonies and engagements. A highpoint of the week is the Garden Party on the grounds of the palace. Some 8,000 people attend the party each year. Music is provided by the Royal Scottish Pipers Society and the Royal Company of Archers act as the Queen's bodyguard. 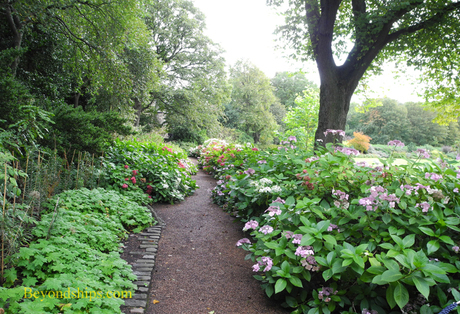 When the royal family is not in residence, portions of Holyroodhouse are open to the public. There are audio guides for self-guided browsing. In addition, there is an evening tour with one of the palace's wardens. The state apartments are open to view. These are the rooms that are used by the royal family for ceremonies and entertaining. They include the Throne Room and the Great Gallery. In addition to their historic interest, these rooms house portions of the Queen's incomparable art collection. The Great Gallery, for instance, has a series of paintings by Jacob de Wit of Stuart monarchs that rather fancifully traces the line back to the 4th century B.C. A number of the rooms at Holyrood have been restored to look as they did in Mary Queen of Scots' day. These include Mary's bed chamber as well as the Outer Chamber where Rizzo was murdered. There are also display cases showing artifacts from that time. Not much is left of the abbey. At one time, it was a quite substantial community centered around a cathedral like church. The Reformation did away with the religious community and in 1768 the roof of the church collapsed. It was decided that it was too expensive to repair and so it was left as a ruin. Its hauntingly melancholy atmosphere remains and is said to have been the inspiration for Felix Mendelssohn's Scottish symphony. During the summer months, the wardens give tours of the ruins. Visitors can also explore the palace gardens. 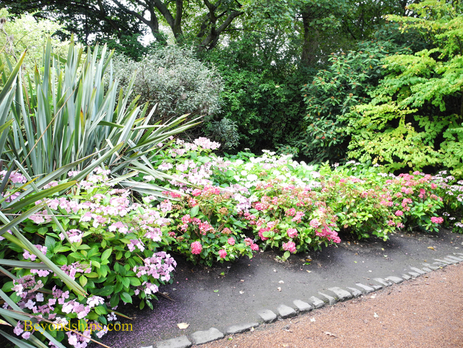 There has been a garden at Holyrood since the time when it was an abbey. Of course, it changed quite a bit over the centuries. Lions, tigers and a camel lived there in the 16th century menagerie. Mary Queen of Scots practiced archery in the gardens. Queen Victoria and Prince Albert found the gardens in an overgrown state and carried out a major program to bring it back to life. Further improvements have been made during the current monarch's reign. Today, the gardens cover ten acres. 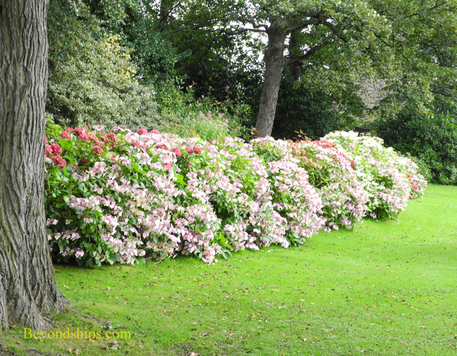 They are beautifully manicured with lively flower beds, tall trees and broad lawns. 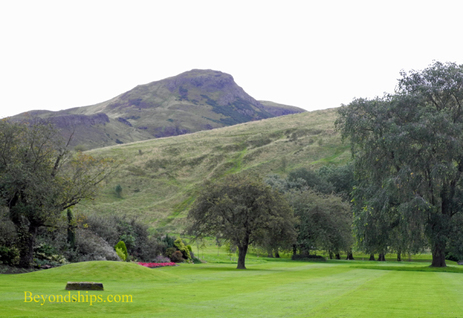 Behind them is the brooding presence of Arthur's Seat and the parkland surrounding it. The overall impression is that you are in the country, not within the precincts of a major city. 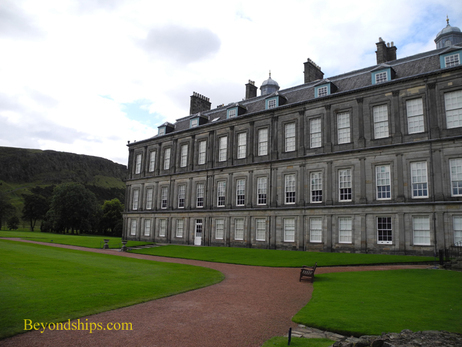 Shore excursions to Holyroodhouse are usually offered during port calls in Edinburgh. (Queensferry is the actual port for most ships). Inasmuch as the palace is in the city, it is relatively straight forward to visit independently.